The bottle spun through the air headed straight for my head. I ducked just in time to see it shatter into a thousand brown pieces on the sidewalk behind me. Then the truck sped away. I left the scene on a skateboard. I was 14 years old at the time, but I can remember the attack like it was yesterday. The shattered beer bottle was a close call in what feels like a long game of cat-and-mouse played out between skateboarders and rednecks in the small, Tennessee town where I went to high school. The game reached its height in the summer months just before school began, when skaters would hit the streets all day to soak in the last gasps of summer; and the older kids would hunt us down in pickup trucks in between beer runs. I remember the trucks well. I remember what colors they were, what models, what makes. And I remember the signature cocktail of the drivers—brown beer bottles and a pack of chewing tobacco called Copenhagen. DENMARK, 17 years later — A tall, wooden arch stretched over a gravel path in the abandoned military barracks. Five words were scrawled into its face, “You are entering the EU.” A hundred yards behind me, dozens of pot dealers ambled around Pusher Street while vendors unfurled t-shirts, jewelry, and handmade goods for the tourists who’d be making their way into the neighborhood after breakfast. I walked past the vendors, stumbled into an empty skatepark, and grabbed a seat on top of a quarter pipe. I was alone in Copenhagen. The graffiti-covered concrete dancing around the abandoned building behind me struck me as one of the most beautiful sites I’d ever seen. It was weathered. It was tattered. It was loved. And it was a strange place to be reminded of a broken beer bottle aimed at my head almost two decades ago. For most of my adult life, the word Copenhagen has conjured up memories of childhood persecution. All those years ago, my friends and I were targeted because we stood out. We were skaters in a farm town. We didn’t listen to country music. We didn’t wear cowboy boots. We were not the norm, and we paid the price. I dodged the beer bottle, but one of my good friends was not so lucky: he got tied to a chainlink fence. His tormenters didn’t care that he was an ace guitar player, that he was the only skater in town that could wall ride, or that he only lived a half mile away from the scene of the crime. They didn’t care about that, but they did seem to care about their trucks, their beer, and their Copenhagen. So it was that for nearly 20 years the word has conjured up images of a round, black can, the smell of chewing tobacco, and the memories of some dark times in my teenage years. Today, I took the word back. “Feel free to take all the pictures you want, mate,” yelled a man from another side of the park, who looked to be about my age. In some parts of this neighborhood, cameras are prohibited. The message seemed like a rare privilege, so I did. Then, for good measure, I took a few more. 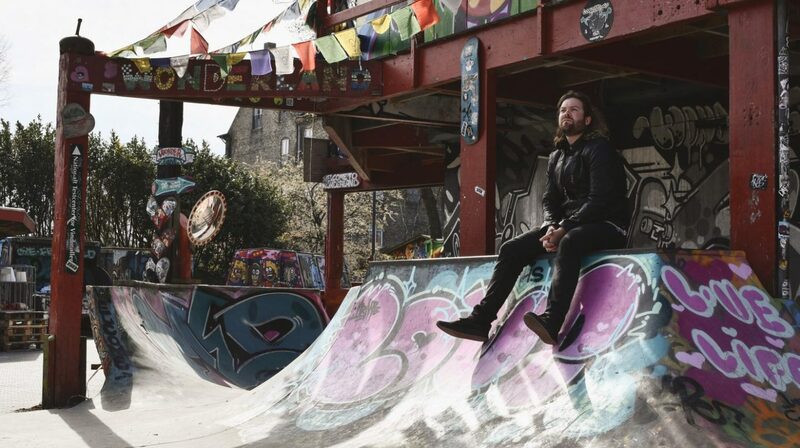 You can find the skatepark in Christiania, a free town built on an abandoned military base in the center of Copenhagen. Since the late 1960’s Christiania has maintained an autonomous identity from its host city. The neighborhood is guarded on one side by a canal and the old city wall. On another, it’s wrapped in a colorful boundary wall with only a handful of entrances. Roughly 1,000 people live inside. Though Danish law has applied there since 2010, the residents of Christiania vote on and create their own rules. They don’t allow violence, gang colors, bullet proof vests, or hard drugs. Famously, they do allow marijuana. And though Danish law outlaws weed, an unspoken truce has allowed residents of Christiania to openly sell hash on Pusher Street and smoke it within the town’s walls. In addition to the markets, Christiania has concert halls, residences, a nature reserve, and plenty of food trucks and restaurants. Nearly everything has been created from abandoned structures left by the military—including the skatepark. “Live Life, Love.” My new definition of Copenhagen. Direct flights to Copenhagen are available from major U.S. cities. Christiania is located on the island of Christianshavn in central Copenhagen. AirBnBs are widely available throughout Christianshavn for around $100 per night. While you’re in town, make your way to Copenhagen’s Tivoli Gardens, the second oldest theme park in the world. Souled Outside recommends 1656, a hidden cocktail bar in Copenhagen’s meat packing district. Try Ragnar’s Cup. We can’t remember any of the ingredients except mead. But seriously, try it. Check out Reffen Food Market, a repurposed shipyard that houses dozens of international food stalls not far from Central Copenhagen. Copenhagen does not have Uber or Lyft, so plan on using public transit, walking, or hailing a cab.